This succulent, fork-tender Mississippi roast can be made in the oven or slow-cooker and with carrots added (optional). Best. Roast. EVER!!! Mississippi roast is a home run main dish on several fronts. First, it is delicious. The savory rich flavor of the meat and the tangy au jus is outstanding. Second, Mississippi roast is ridiculously easy to make. Six ingredients, a slow cooker, and 8 hours are all you need. Third, leftovers are fantastic. As one who is a bit leftover averse, I found this roast to be an exception. I had it for dinner two nights in a row and loved it as much the second night as the first! Note: Although you don’t HAVE to brown the roast, I always do. Browning all sides in sizzling oil just makes for deeper flavor and a more caramelized exterior. It only takes a few extra minutes, and I highly recommend it. Slow cooker or oven method: This roast is wonderful made in the slow cooker or roasted “low and slow” in the oven. When using my slow cooker, I cook the roast roughly 7-8 hours on low. When baking in my favorite Lodge Cast iron Dutch oven or my enamel Dutch oven, I cook the roast on 225 degrees for 7-8 hours. Carrots can be steamed in a microwave Zip & Steam until fully cooked and added to the roast during the last few hours of cooking. They will absorb some of the flavor of the au jus; they are delicious! 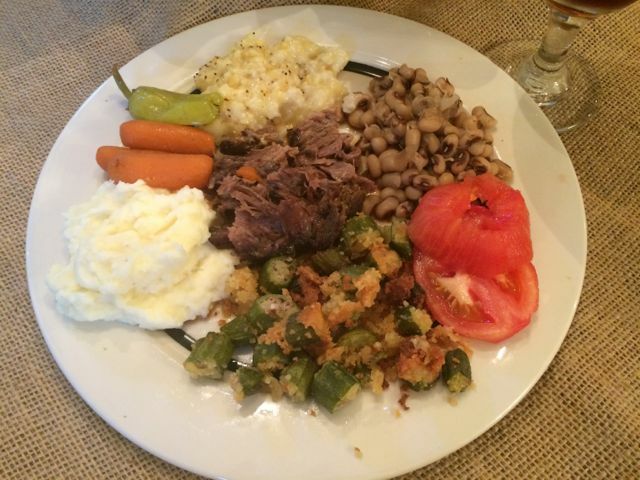 We love eating Mississippi roast with simple creamed corn, perfect black eyed peas, creamed potatoes, and sliced tomatoes (see photo below). Who needs Cracker Barrel when you can cook this feast in your own kitchen? I hope your family loves this roast as much as mine does. If you make it, please let me hear how you like it! As always, thanks so much for stopping by! Be blessed, and stay savvy! A five-ingredient roast that your family will rave about! Brown roast in 2 TB oil over high heat until all sides are seared. 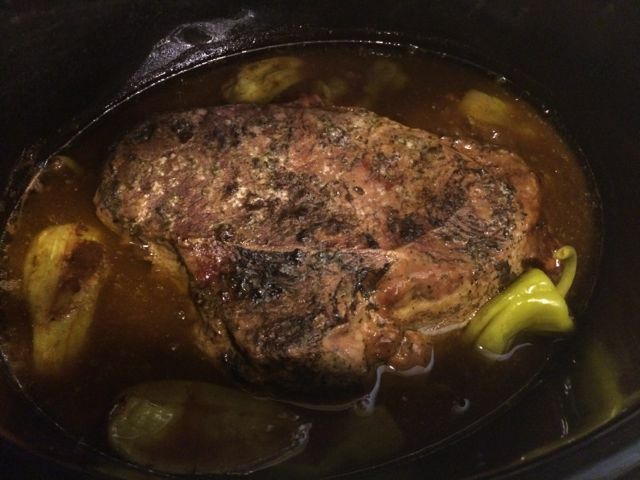 Place roast in slow cooker or Dutch oven. Sprinkle ranch mix over roast. Sprinkle au jus mix over roast. Place stick of butter atop roast. Scatter the peppers on top. Drizzle juice over the top. In slow cooker, cook for7-8 hours on low. In oven, cook for 7-8 hours (until fall apart tender) on 225 degrees in middle rack of oven. If adding carrots: Steam baby carrots for 10 minutes in microwave bag until just cooked. Remove roast; wrap in foil and keep in warm oven. Pour roast drippings (au jus) into saucepan. Add carrots to saucepan; simmer in au jus over medium heat for 20-30 minutes. Place roast on platter surrounded by carrots. Hi Chris! Thank you for pointing that out!!!! When I added carrots/potatoes as options, it kicked that number up. Appreciate your pointing it out!!!! Have a blessed day!!!! No biggie, but the description states 4 ingredients, the ingredients list has 6 listed. Love this recipe. I add 1-2 whole chopped onions instead of the carrots. (Have tried with carrots, and somehow they neutralize the savoriness of the Pepperoncinis…) Getting ready to start another one now! Hi Sue! Thanks for your question! I modified the post to answer, as I was a bit confusing. Basically, the times are approximate. Since you are cooking to “fall apart,” you have leeway. I find that mine is perfect after 7-8 hours, after which I leave roast in the oven (turned off) until serving time. Hope this helps!!! You first instruct to cook this in the oven for 8-9 hours and secondly you say to cook in the oven for 7-8 hours. Which is it? Hi Stephanie! I know that pot roast can be cooked in the IP~I’ve just never done it! I would think you could do it with the Mississippi roast ingredients following IP instructions for roast. If you try it, let me know how it turns out! 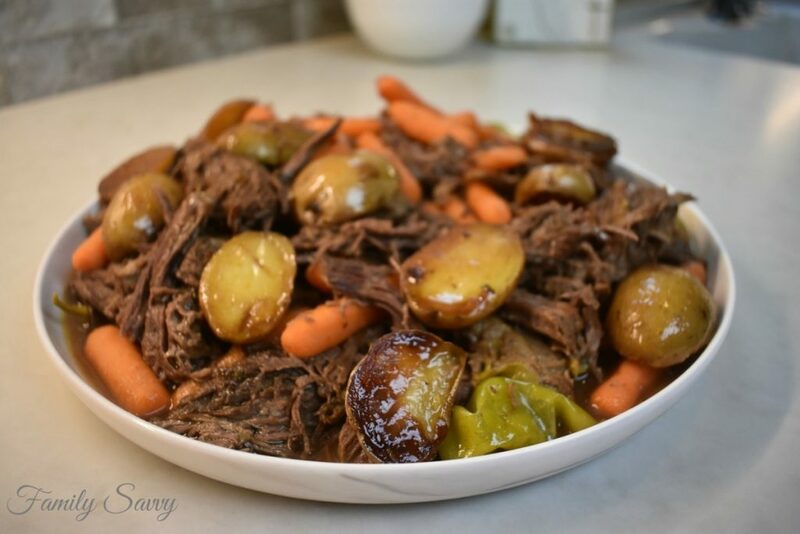 I love this pot roast recipe! Iâ€™m wondering if you think it can be done in the instant pot?! ?